Who is Going to be the Next President of the United States ? Beats me. But I do know that both runners up, Republican and Democrat scare the fool out of me. Bring back the good old days. 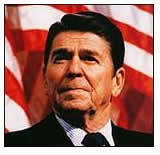 Reagan was a good president, a motivator and an excellent orator. Clinton was always entertaining. You woke up in the morning just to see what mischief he had gotten into the day before. Actually, I believe its going to be fun watching both Obama and McCain duke it out against one another. And whoever wins will still bring a witches brew of political excitement. The most basic principle to being a free American is the notion that we as individuals are responsible for our own lives and decisions. We do not have the right to rob our neighbors to make up for our mistakes, neither does our neighbor have any right to tell us how to live, so long as we aren't infringing on their rights. Freedom to make bad decisions is inherent in the freedom to make good ones. If we are only free to make good decisions, we are not really free. Much of the world's history over the last century has been dominated by the United States. But by the turn of the millennium in 2000-2001, the “American Century” had begun to descend into a chamber of horrors. This week I want to share with you one of the more important tools in my arsenal for keeping up with what is going on in the world. As I've told you before, George Friedman and his team at Stratfor are my go-to guys for geopolitical intelligence. Their insights into this facet of the world are simply without peer. Now I want you to see their Intelligence Guidance which they publish each Friday for the upcoming week; last week's edition is below. Fiat money is an oxymoron. Traditionally, money has been both a storehouse of value and a medium of exchange. Fiat money exists by mimicking both; but when its ability to do so ends, fiat money exposed for what it is, reverts to what it is—government issued coupons with expiration dates printed in invisible ink . Fiat money distorts the time value of money and in so doing destroys both money and the economies that use it. Real money like gold and silver has value over time, the greater its value and the longer it endures, the more likely it will be accepted as money. The news items this week point to a severe international crisis point ahead (maybe within months of now). Sweden has enabled new surveillance measures on the heels of Germany . The Treasury's man Paulson thinks procedures for future bank failures should be erected. The Bank of England is warning the British (like my friend Bev who wouldn't listen to anyone but his financial advisor, and my New Age friends Sharon and Jo who are busy "Ascending") that tough times are ahead and to downplay union strikes to protect against upward wage pressures. Nobel Laureate Buckminster Fuller's introduction to his Critical Path is titled, Twilight of the World's Power Structures . Published in 1981, Fuller's book predicted the end of the world's power structures during a process where humanity would undergo a crisis of unprecedented proportions . What is the importance of the war in Iraq relative to other current issues? This is a question I am often asked, especially as Americans continue to become increasingly aware that something is very wrong with the economy. The difficulty with the way the question is often asked relates to the perception that we are somehow able to divide such issues, or to isolate the cost of war into arbitrarily defined areas such as national security or international relations. War is an all-encompassing governmental activity. The comically complicated PSA (Personal Savings Account) legislation bouncing around Congress will raise taxes, increase investment risk, and expand the size of government. Let's stop applying Band-Aids to spouting arteries. We are looking for a guaranteed retirement benefit program, and organizations capable of providing one. Additionally, we want the new program to reduce taxes, create jobs, boost the economy, cut prices, and increase salaries. Difficult? Not really. Barrack Obama's economic policy is one of incredible stupidity. He plans to bludgeon the economy with massive tax increases while flooding it with astronomical spending. Is this bloke a genius or what. (The question, of course, is rhetorical). But how in heavens name does such economic idiocy become common currency, particularly in the politically corrupt media? As the economic indicators turn down and election year politics heats up, the calls from politicians for more government intervention and enhanced economic stimulus are becoming more strident. Last week, with the onset of the general presidential campaign, and with increased attention on the economy shown by the Bush administration, I could not help but think that something big was in the air. And by big, I mean the kind of massive new Federal spending initiatives that we haven't seen since the Great Society of the 1960's. Now that Obama is the Democrats' contender for the presidency, they can resume their attacks on the US economy. These moral cretins have still got the effrontery to assert that the Bush economy is one of the worst in the country's history when that appellation should be awarded to the Roosevelt administration. (The second worst would be the Hoover administration). Democrat Albert Gore had won the popular vote in the November election but was behind in electoral votes. The controversy centered on Florida , where the official tally showed Bush the winner by a narrow margin, but where the Court decided a complete recount might leave the nation with an undecided election for too long. It later turned out that many eligible Florida voters had been improperly excluded from voting by partisan state election officials. After Ronald Reagan assumed the presidency, I worked for two years at the U.S. Office of Consumer Affairs, which was an extension of the White House consumer office. The president's special assistant for consumer affairs was now Virginia Knauer, who had held the same office under President Richard Nixon, and for whom I wrote speeches and reports. We were afraid that with the Reagan cuts of the federal civilian budget our office would be abolished, but that didn't happen.